Queen of the Clan: A Clean Sweep - Catching up! Last Friday, my hubby took the day off work to celebrate our anniversary. Want to know what we did? We cleaned out our basement. Seriously. And I was the one who suggested it! We had so many boxes just waiting to be unpacked from our move 2 1/2 years ago. I really wanted to be able to do the laundry and not feel claustrophobic. I was also concerned that if there ever actually WAS a tornado and everyone was in the basement, that we'd have tons of stuff flying everywhere! I was amazed at how much stuff we went through! Some of it was set aside for a garage sale in a few weeks, some of it was put away in the house, and a whole huge pile of it went into the trash. I found a few things I had been hunting for - like my family genealogy cards and my kids birth certificates. All good things to locate! As a result of our efforts, we came across the toddler bed my hubby's grandfather made for our kids - which led to a conversation about if Anna was ready to leave her crib. The real question was if Mom & Dad were ready to chase Anna for nap and bed time! As you can see, we decided to try out the big girl bed . . . and Anna was thrilled! The pillows are for accidental tumbles! Anna . . . late that night. It's a good thing we put the pillows there! Saturday morning, John & Isaac went to the Sprint Campus run. Here they are with the "running rabbit"! John ran along-side Isaac in the kids 1K race. On your marks . . . Get set . . . Go! Isaac took 2nd place in the Kids 1K run! Yeah Isaac! Now for some more fun . . . I've been nominated for some really fun blogging awards! 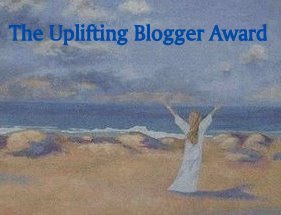 Thank you to Shauna for giving me The Uplifting Blogger Award. This is an award I truly appreciate. While I enjoy doing fun stuff like contests, etc on my blog, I truly hope it's inspiring to all the other writing moms and moms raising kids with special needs . . . Thank you so much! Two bloggers have awarded me with the Kreativ Blogger award. Thank you Heather & Nichole! Now, there's more to the Kreativ Blogger award. Here we go . . .
1. I absolutely LOVE my freckles! 2. I was once asked to describe myself without saying anything about my physical features. My response was - I'm the girl from your favorite chick flick. Not the gorgeous main character, but the quirky best friend. 3. My response to #2 gave me a whole new book idea! Coming soon! 4. I was a major flirt in college. Anyone surprised? 5. I love girly stuff - pink stuff, shoes, purses, etc. 7. We've been paying off our debt for the last year and have made a ton of progress. But when I paid off my Old Navy card . . . and canceled it, I actually cried. I couldn't even cut up the card. I had to give it to my hubby to do the honors. It still makes me teary. 1. Shauna @ Trying to Stay Calm- it amazes me all the awesome stuff she gets for her contests! 2. Amy @ What a Kick in the Pants - Amy's knack for everything homemaking related has left me in awe since our college days. 3. Joni @ Modern Myrtle - Joni makes custom bags and scripture totes for me. Personally, I can only sew square blocks together. Joni's talent is truly incredible! 4. Heather @ Just a Little Minute - Now Heather just cracks me up! I love her humor and perspective on enjoying motherhood. 5. Kris @ Meet My Camera - You want creativity? Go check out Kris' photography. She always has the most gorgeous pictures! I don't know any of the people in her pics, but I just fall in love with them anyway. I would love to have her do our family pics the next time she's out in KC. 6. Stephanie @ She Does Hair - Stephanie has stopped posting new hair-do's, but has left her blog up as a reference. I love searching her archives. She has such fun kid hair-styles! 7. Cheryl @ KC Temple Chaser - I love that Cheryl used her creative talent to journal all the happenings for the upcoming Kansas City Temple. She also posts inspirational thoughts and events at other temples around the world. So there you go, my friends. I hope you feel a bit caught up - and that you've discovered some awesome new blogs! Have a wonderful day!!! I feel like I haven't been on here enough. Things are just crazy here. Wow Isaac is speedy! Great job big guy! Hi! I just wanted to stop by and say hi to you. I found you on Shauna's blog for the uplifting award she had on her blog. I read the comment you made on her blog. I have been feeling very let down by certain friends that I have lately and just haven't been feeling myself at all. I try to stay positive and be around people who have that positive energy flow. I want to get to know more people like that. It's nice to meet you. Hope to get to know you better!